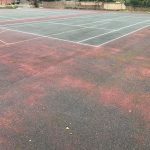 It’s easy to look at a dilapidated tennis court and think that the cost of restoration might be more trouble than it’s worth, but it may be more cost effective than you realise. A perfect example of this would be our restoration and enhancement project at St. John’s college in Oxford. The college got in touch to say they had some tennis courts that were in need of some TLC and were interested in reviving them, as they were extremely popular with the students. Their existing area actually comprised of three tennis courts and, with the courts being used by thousands and thousands of students over the years, had obviously seen a lot of wear and tear. The original colours of green for the courts and red for the surrounding area had long since faded, and the white line markings were so faint it would have been hard to know if your shot was ‘in’ or not. The surface itself was cracked and pock-marked and, in truth, it had seen better days. This is where Sports and Safety Surfaces came in. The first step to this restoration was a deep cleaning of the entire area. Our team used a specialist, two-part deep cleaning technique. 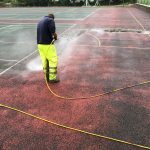 The first part is designed to remove any and all traces of dirt from the area using a combination of a solution designed specifically for use on tennis courts and a high-powered pressure washer. This included leaves, mud, algae, litter and other contaminants, but it was important to make sure that the court was as clean as it could possibly be before moving on to the second stage. This involved applying a specialist polyurethane binding solution that would not only prevent any further buildup of future contaminants, but would also strengthen the surface but would allow the paint to stick better too. Once the court was clean and sealed, it was at this stage where any repairs that needed to be done took place. The client opted to stay with a tarmac surface but a new surfacing such as polymeric rubber would have been just as appropriate. The various holes and cracks were filled and smoothed over before the application of the paint. The paint itself is made up of a very clever combination of properties. Firstly, and most importantly, it meets the anti-slip TRRl 5 standards required by the LTA governing body as well as meeting SAPCA standards for safety quality. The paint itself consists of a mixture of sand, aluminium oxide and porous acrylic paint. This is important for a few reasons. Firstly, from a safety point of view, the sand gives the surface more grip. This means that in bad weather conditions or when players run or over-stretch to reach a shot, they have the best possible grip and the risk of them slipping and falling is greatly reduced. 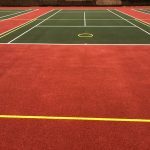 This also has the added benefit of making the surface extremely hard-wearing, so the court should have an extended lifetime if it is properly maintained. The second part is the really clever bit. The acrylic paint aspect of the combination is porous, so this means that rain and standing water will actually drain away from the court. This means no more waterlogged court or standing water, and it helps to keep down maintenance and repair bills down to a minimum. The paint is compliant with the tough SUDS requirements, so the client was happy that they were getting a top quality product. 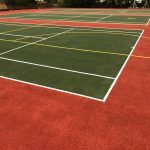 For the actual colour of the paint, the client chose to stick with the original colour scheme; green for the courts, traditional white line markings and a bright red outer court. This request was easily satisfied, although they could have had a variety of other colours and combinations had they so wished to. The finished result was a revelation, colourful, pleasing to the eye, inviting, and a lot safer than it had been just a short time ago. The new courts were barely recognisable as the dirty, unsafe courts they had been. St. John’s College were over the moon with the results, and the students now have a bright, safe space to play tennis in. This kind of restoration doesn’t take as long as you think. Obviously, the larger the area, the more time that will be needed to restore it to its former glory. In essence though, this type of project could be completed in under a week, so your tennis court could be revamped and back being used in under seven days. What are the Advantages of Restoring a Sports Court? The advantages to restoring an existing court are many. It turns an otherwise unattractive and potentially dangerous (especially if the court is contaminated with algae) area into a safe and and inviting area that encourages people to use it and stay fit. 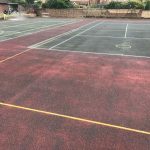 As mentioned above, St. John’s College chose to stay with a tarmac court, but other surfaces such as macadam or polymeric rubber are ideal for use on a tennis court. These specialist surfaces are hard wearing, have increased slip-resistant properties and are easy to maintain. As with tarmac, macadam and polymeric rubber surfacing is available in a number of different vibrant colours and combination. We have been installing and maintaining sports and athletic surfaces for over 20 years and have built up a wealth of knowledge during that time. 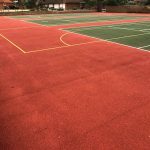 Tennis courts are just one of many MUGA surfaces that we regularly deal with, and they highly customisable according to client requirements. We can supply and install a variety of surfaces, paint finishes, repair packages and restorations for your school, college, university, gym, public park or recreational area. From a commercial point of view, having an up to date, safe and colourful court could inspire more membership to a club or gym, and might cost less to install than you might think. If you are interested in Sports and Safety Surfaces sports court maintenance, make sure to get in touch with one of our professionals today. Our pricing process is quick and easy. All you need to do is send over some photos of the court and our team can assess the situation and see what needs to be done. Being a leading sports surfacing company, we are able to offer you the very best maintenance and restoration services, so make sure to get in touch! Contact us today by clicking the link at the top of the page if you have any questions about tennis court painting, MUGA surfacing or polymeric surfaces and one of team of experts will be glad to speak to you and discuss your individual options and requirements. 3.1 What are the Advantages of Restoring a Sports Court?